Diana Campbell Betancourt (Artistic Director of Samdani Art Foundation and Chief Curator of Dhaka Art Summit) speaking at the 9th Asia Pacific Triennial. 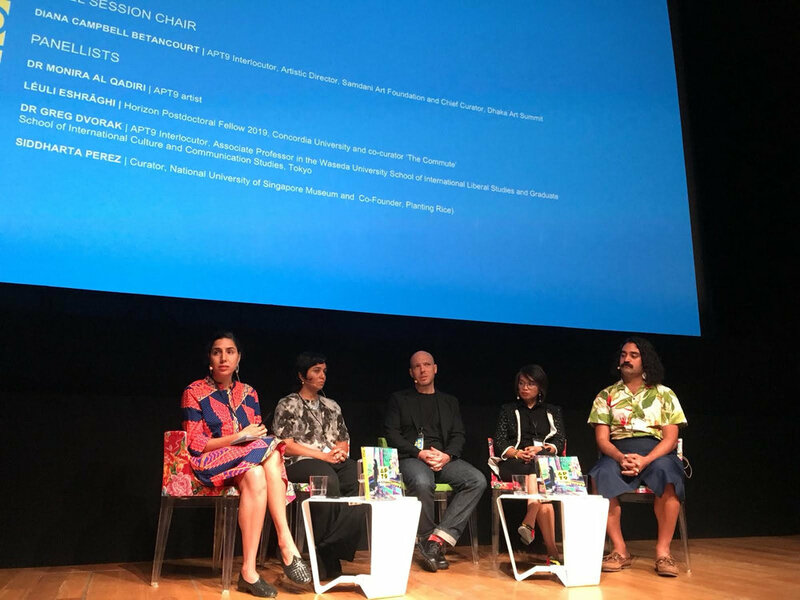 The Samdani Art Foundation and Dhaka Art Summit 2018 are delighted with their partnership with the 9th Asia Pacific Triennial organized by the Queensland Art Gallery & Gallery of Modern Art in Brisbane, Australia, which facilitated the participation of Bangladeshi visual artists in this important regional and International platform for the first time. Tarun Nagesh, Associate Curator, Asian Art, QAGOMA, served as a DAS 2018 fellow and Diana Campbell Betancourt, Artistic Director, Samdani Art Foundation served as a curatorial interlocutor for APT 9, and Bangladeshi artists Ayesha Sultana (who won the 2014 Samdani Art Award) and Munem Wasif were commissioned to make new work for the exhibition. SAF also wishes to thank Artspace Sydney, the Australia Council for the Arts, and Australian Embassy High Commissioner Julia Niblett in Dhaka for being an integral part of this continuing journey of increasing artistic exchange between Bangladesh and Australia.